Whether you’re a die-hard shedhead or a newcomer to the wonderful world of garden buildings, we can all agree on one thing: with the humble garden shed undergoing a bit of a renaissance at the moment, there are some pretty exciting designs out there to choose from. Which is where our list of the best garden sheds comes in. Whether you are looking for a space to stow the lawnmower, or want a little garden retreat – we have you covered. And once you've chosen the shed that's perfect for your garden, check out our sourcebook of top garden suppliers for more garden-related shopping. What is the best garden shed? There are tool sheds, potting sheds, and even swanky sheds with room to sit; studios, summerhouses and outdoor offices that push the boundaries of what we imagine a shed to be (you can thank George Clarke’s Amazing Spaces for that, we suspect!) There are about as many types of shed out there now as there are types of gardener, and some – most notably our standout ‘Garden Pod’ from John Lewis – frankly don’t look very much like a shed at all. Designed to be an extension of your home without the expense and fuss of planning permission and tripping over builders all day, garden rooms and studios are a wonderful middle ground that allows you to work or play outdoors whatever the weather, and while they will be pricier than your average spider-friendly shed, the potential for electricity and insulation makes them worth consideration for home workers and serious hobbyists. Somewhere between these and traditional sheds are summerhouses, usually more fortified and with added design kudos – these can boast everything from double glazing to integrated verandas, without necessarily costing the earth. Then, there are shed sheds, rustic wooden structures for potting, pottering and storage that always look at home, no matter your style of garden. No matter what kind of outdoor haven you’re looking for, we think you’ll find something for consideration on our list, so keep reading for our round-up of the best sheds in the shops. If your garden is on the smaller side, check out our buyer's guide to the best small sheds for your garden. This gorgeous garden room takes the cake when it comes to creating functional space outside the home. With double glazing throughout and fully insulated walls, floor and ceiling, it’s every inch the indoors, outdoors, meaning you can admire the garden from the floor-to-ceiling windows and door without sacrificing comfort. Reviewers loved the gorgeous Scandi-style cladding and contemporary shades, and commended the value – and for this combo of affordability, functionality and design, it’s our best. Liked the look of our first Crane pick but can’t justify (or squeeze in) a full garden room? This petite summerhouse has the same great build you’d expect from the brand, lovingly built from FSC-certified Scandinavian redwood, but with dimensions befitting of a smaller garden. It has a more traditional vibe than our first pick – we particularly love the multi-faceted roof and leaded windows – but still has a light and airy feel thanks to the front and size windows and pale matte woodwork, and reviewers gave its sturdy build a big thumbs up. Unlike our first two picks, this is less a shed for sitting, and more a shed in the traditional sense – it’s far from pedestrian, though. Its elongated shape, rectangular at one end with an attractive windowed bay at the other, makes it exactly the right shape and size for potting and storage. The included potting benches are surrounded by seven fixed and three opening windows, pulling in sunlight in the gloomy winter months, and keeping you cool while tending to seedlings in warm weather, while the pad bolt gives you provision to keep bikes and tools away from prying eyes and sticky fingers. 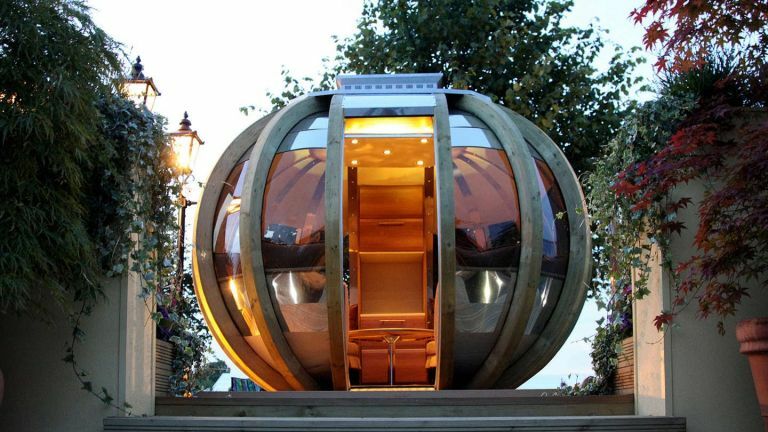 A name as pastoral as Farmer’s Cottage might not seem terribly fitting for this positively space-age garden pod, but then it’s full of surprises. While it’s a bit of a given, for the slightly wince-inducing price, that it’s smarter than your average shed, it’s worth outlining what makes it worthy of its spot on the lawn. Architecturally, it’s a stunner, an unusual glass and wood-beamed sphere that reflects its surroundings to blend in better than you might think. Inside, it’s fully sealed, equipped to support 240v of power, and totally waterproof, meaning you can sit out even when it’s chucking it down. Perfection, if a bit pricey! When you’re thinking “shed”, this one from Forest Garden might be more in line with what you imagine, but it still has a few twists on the classic that make it far more than just a place to put your bike. Just the right size for a couple of chairs, a lamp, a table, and a big pile of books to work through, this is a great affordable shed-meets-summerhouse for shutting out the world on gloomy days, or welcoming the sun as you kick back with guests in the warmer months, and we particularly like the sweet integrated veranda. If you’re simply in search of a storage shed and have been trawling through our list of stylish studios and summerhouses, don’t worry, your patience will be rewarded! This 6 by 10 shed from Wayfair is our pick of the bunch. In terms of looks, its overlap cladding and solid European softwood are about as traditional as they come, but a far cry from its squat square cousins in terms of capacity, it offers plenty of room for whatever you hold dear – and the water and weather resistant design means it’ll take good care of it too. Inspired by our first pick studio space? See our guide to creating your perfect garden office just in time for the warmer weather to roll in.